After topping up the echo sounder's oil and replacing the wiring we concluded that it needed a new transducer. Sailing in this area without would be dicey, to say the least. 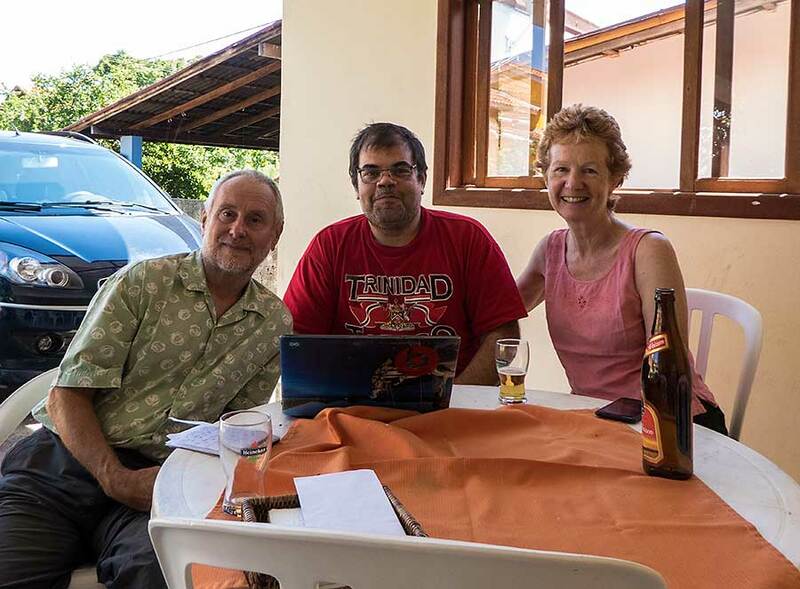 Marco had invited us for a barbecue on Easter Saturday so while his neighbour, Josefa, was doing the cooking he and Paul were on the internet looking for a supplier. For Easter Sunday we were invited to Josefa's house for a meal of various tasty fish dishes. Marco cooked a shrimp Moqueca - a speciality of his native Bahia - which was really delicious. And we are slowly getting used to the Brazilian habit of sprinkling manioc flour on almost everything they eat! It rained but we had a good time, stretching our limited Portuguese to its limits. Thankfully Josefa's son Rafael speaks good English - having spent time working in New Zealand - so we didn't always have to rely on Marco and Daniela for help in making conversation. That night the wind shifted to the south. It was strong enough in the early hours to make the sea choppy and our anchor plough through the soft mud. Without an echo sounder we had to carefully make our way (thank goodness for GPS) up to the north of the island to Jurere - another anchorage we had visited in 2013. We spent a day or so there comfortably sitting out the southerlies until it was safe to return to Santo Antonio. Back in Santo Antonio the weather was settled so we spent a pleasant week at anchor, waiting for the replacement transducer and hunting down less essential but useful things like a local gas bottle - one that would fit into our gas locker - including the necessary fittings. Marco had ordered the transducer over the internet and got it to us before he and the family went off to Florida for a holiday. With twin boys of 7 and a daughter of 5 the lure of Disneyland is as strong here as anywhere in the world! We were sad to say goodbye to them but it was also time for us to move on. 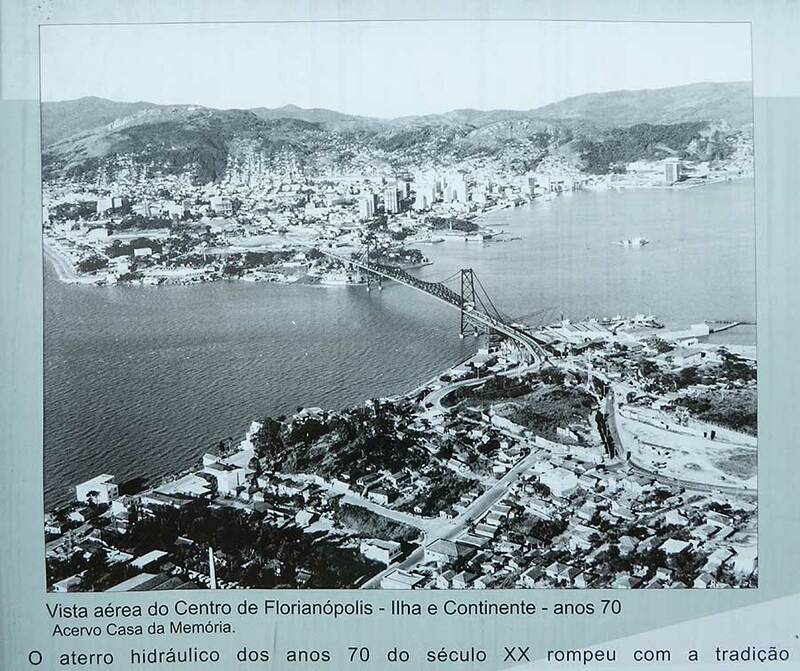 With the echo sounder working we paid one last visit to Floripa and also crossed the bridge to visit the Capitania (to get our "permission to leave" stamp). Returning to the city we managed to find a newly refurbished pathway that runs underneath the southernmost bridge. We walked across and continued along the coast road for a final look at this lovely city. When we'd had enough of farewells we treated ourselves to a "kilo" lunch and shopping at the Angeloni supermarket - which stocks proper sliced bacon and tasty cheeses, among other luxuries. Back at Santo Antonio Mr Cid - the friendly owner of the little marina there - had found us a suitable gas bottle and fittings so we were ready to go, especially as more southerlies were expected. 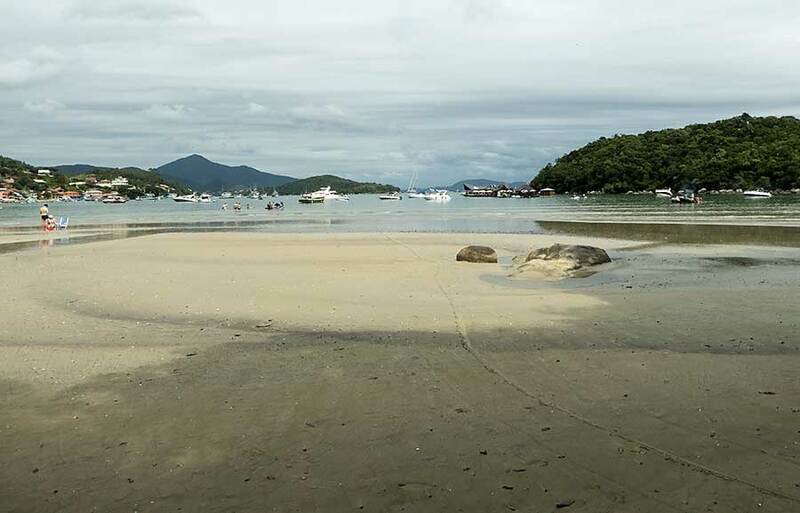 We were looking forward to exploring the coastline, in search of much publicised (in the tourist brochures) clear water for swimming and snorkelling - a rarity in Brazil. However, the forecast was for a week of unsettled weather, with cloud and drizzle! For our first passage we ventured just 6 miles to a small cove on the mainland - called Magalhaes - that Roger on Kiriwina had told us about. We arrived at dusk and dropped our anchor off the shore near a few houses and fishing boats. We were promptly visited by a hoard of mosquitoes looking for their evening meal. After dark the fishing boats got into action, chugging around the bay making a lot of noise (but with no lights, as this is supposedly a conservation area where fishing is not allowed) for an hour or two then going elsewhere and returning just before dawn. Apart from that it was an ideal anchorage with good shelter from the south. The next day we finally sailed out into deeper water and north, following the coastline to the next large bay called Tijucas. 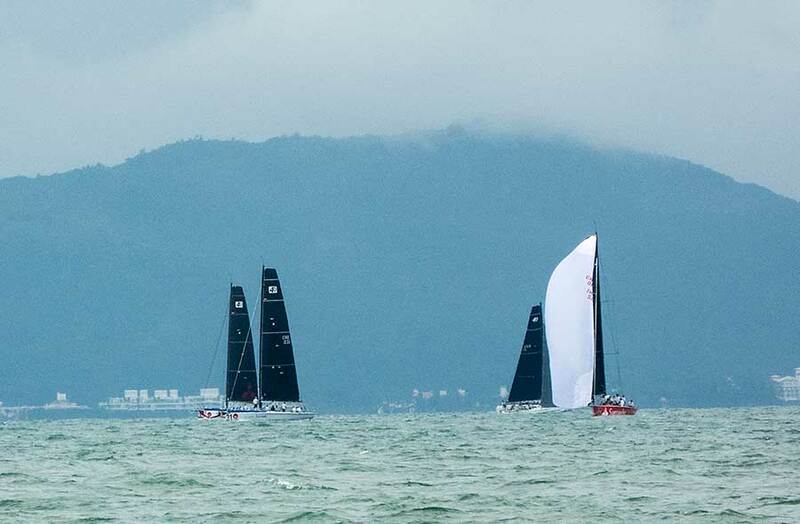 As we headed out to sea in murky weather, we could just about see the S40 world championship racing taking place off Jurere. 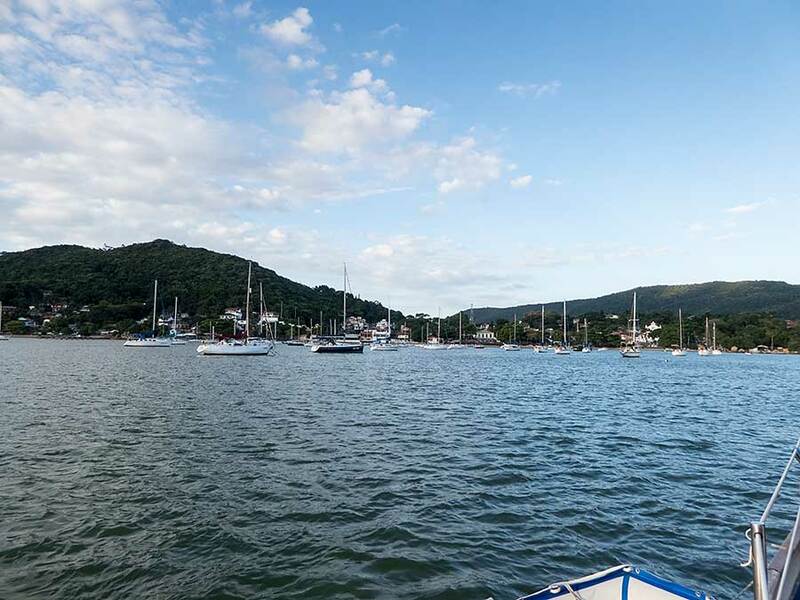 The coast of Santa Caterina is popular for international sailing - the Volvo Ocean Race is currently having a stop-over at Itajai, a port just north of here. The coastline is very pretty with not too much development, and plentiful fish and seabirds. We sailed downwind just using the genoa for about 10 miles then turned into the bay of Tijucas as the weather closed in. It was raining by the time we reached the village at Ganchos, which has a distinctive Igreja dos Navigantes (sailors' church) and cemetery on the hill overlooking twin coves. The shallow water is littered with shellfish farming buoys - easy to spot in daylight but a potential hazard at night. The first cove was quite busy with fishing boats and so we entered the second, which has a yacht club jetty (empty) and more fishing boats. In the absence of any signs of activity at the yacht club we simply anchored off and stayed aboard in the rain. The mozzies came again at dusk and the fishermen came and went during the night but it was a good place to be - even in easterly winds - until the wind dropped at dawn and the swell started rolling us around. And with a forecast for northerly winds we needed to move. 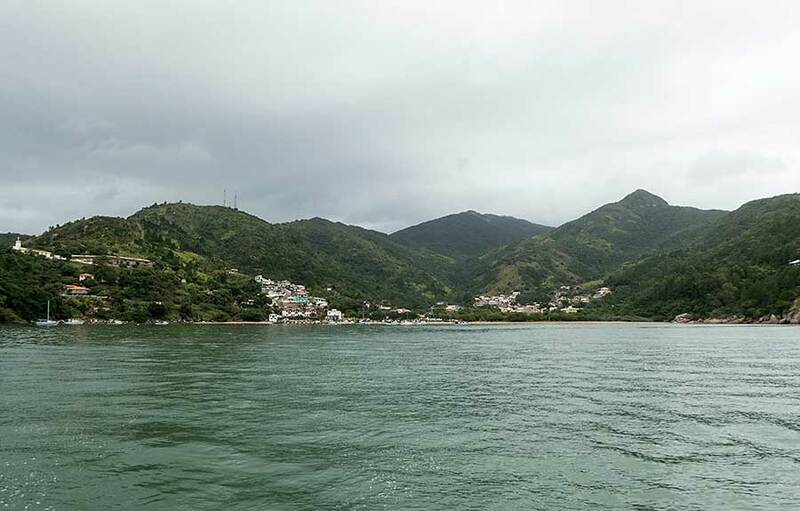 We had an uncomfortable motor - with the swell making it very bouncy - 8 miles to the north of Tijucas Bay towards the long beach on the south side of the Porto Belo peninsula. This beach shallows off quite gently and much of the shallow water is taken up with shellfish farming. We anchored well off the shore and spent a quiet night there away from the mozzies with only a few fishing boats coming and going. 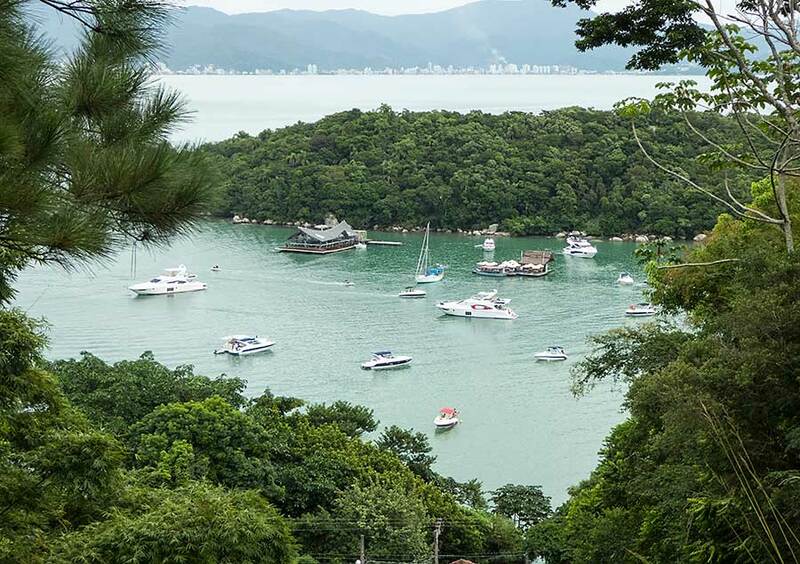 We were now visiting one of Brazil's most scenic bits of coastline, the Costa Esmeralda, but the swell and gloom wasn't conducive to stopping at iffy (exposed) anchorages in the pursuit of snorkelling opportunities. It was Saturday as we motored around the peninsula and we came across lots of small boats wallowing in the swell, carrying weekenders who were trying to catch fish. 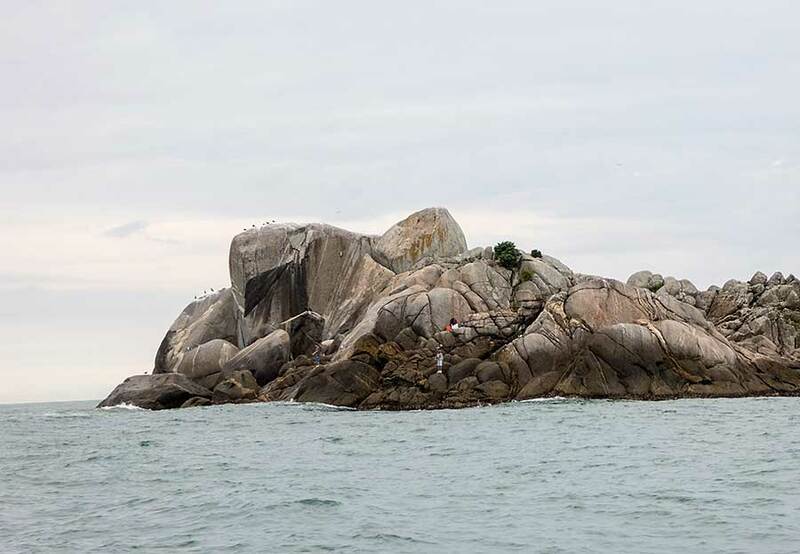 Fishing is a popular pastime: some stand on the rocky headlands while others sit under small canopies to shelter from the rain. 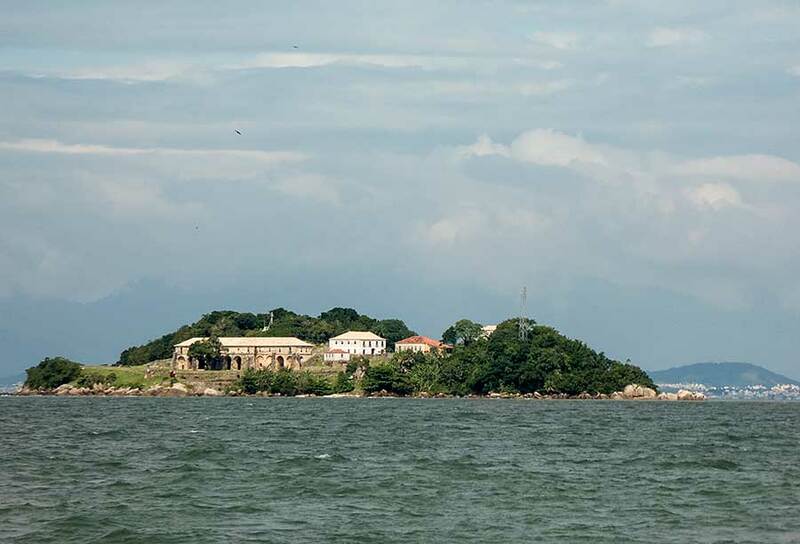 We motored into Porto Belo and eyed up the anchoring options. There's a pretty cove called Caixa D'Aco (Iron Box) about 2 miles north of the town but it looked busy and we needed to do some shopping so we motored on. We expected to find the area off the town busy with moored boats but it wasn't. The depths are quite shallow so we had to drop anchor south of the town centre. Once settled we went ashore in the dinghy and found what we needed: an ice cream parlour and a supermarket. In the dinghy going back to Lynn Rival we could see that she was rolling a lot. The swell was managing to enter the bay at the only spot we'd found with enough depth. By then it was late afternoon so we decided to try our luck at Caixa D'Aco. As we motored back we could see lots of power boats returning to the nearby marina. By the time we got to the bay it was nearing dusk and only a few of the weekend gin palaces remained. 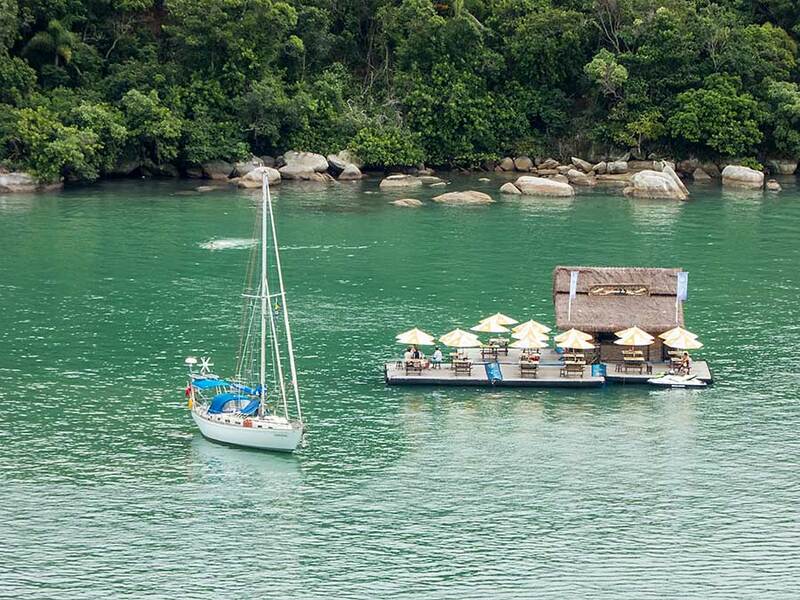 As we stooged around looking for the best place to anchor we were hailed by Eric, who runs "Balanco do Mar", one of the three floating bar/restaurants there. He kindly offered us his mooring on which he normally keeps his sailing boat - currently in Joinville for maintenance. Lynn Rival on Eric's mooring - not far to row to his bar! Saturday night was very peaceful. The remaining gin palaces were remarkably restrained in their taste for music and went to bed at 11.30! Could they really be Brazilians? On Sunday morning the sun came out and the party started again. Eager to take advantage of the good weather we went ashore to the little beach and walked up the hill in hope of finding a viewing spot. The best we found was at a restaurant overlooking the bay where we had a juice while we sat on the veranda admiring the view. A few diners were tucking into what looked like delicious seafood dishes but we were saving our appetite for later. Back at the beach - no longer very large because of the incoming tide - the bay was filling up with motor boats of all sizes, some of them appearing to be on fire (smoke from their barbecues), others competing to produce the loudest music. One of the reasons the bay is so popular is because the water is relatively clear, though by no means crystal clear. We wanted to have a swim but with so many boats about we chose to go by dinghy to a quieter spot near the headland. Afterwards we went to Eric's bar and tried some of the local seafood: delicious fried prawns with garlic. The party went on until after dark, though the all around music did drop off a bit. Although the weekend was coming to an end, Tuesday is a Brazilian bank holiday - recognising the martyrdom of Tiradentes in 1792 - so some were making a long weekend of it. But on Monday morning the heavens opened and everyone went home. 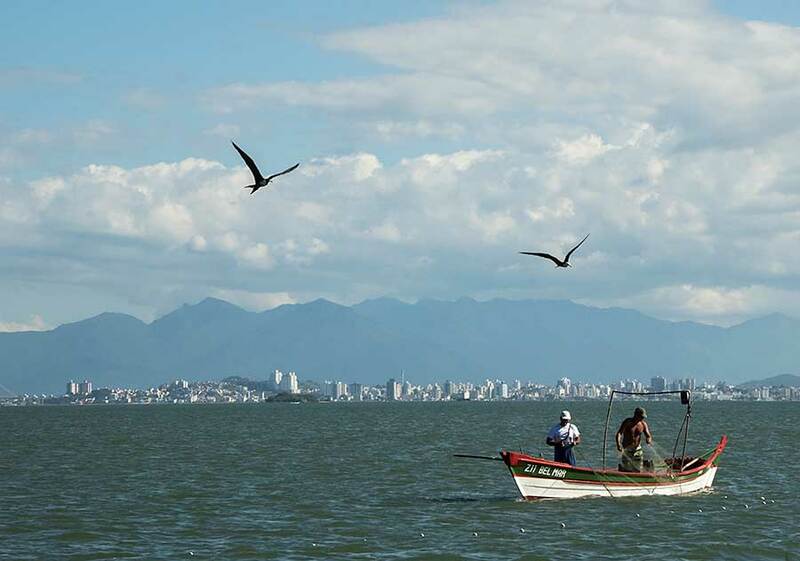 Next stop will be Sao Francisco do Sul, 65 miles to the north of here, so we are hoping for southerlies.